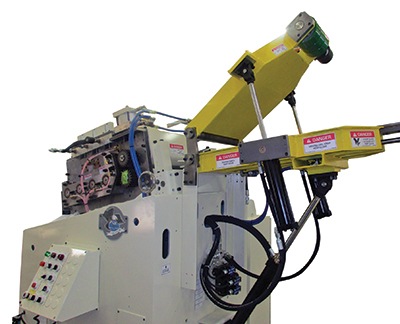 Coe will showcase its 350-series power straighteners with new design features that enable processing of a wider range of materials including advanced high-strength steels (AHSS). The straighteners offer a 30+-percent improvement in strength and rigidity due to increased roll-journal diameter and radius, and increased bearing-load capacity. The straighteners also feature enhanced outboard support, new idler shafts, improved backup design and other updates. Importantly, the straighteners also increase work-roll penetration by 30 percent, helping achieve the material flatness required to properly feed AHSS. The 350 straighteners handle coil widths from 1.0 to 54 in., thickness from 0.010 to 0.310 in., and coil weight to 30,000 lb. And, the modular design of their straightener heads allows them to be retrofitted to existing coil-processing lines.